This apple pie is so much more-with a creamy, spicy filling infused with cinnamon, maple syrup, and cardamom. Every person in the house will be drawn to the kitchen as the aroma wafts through the air. For the truest maple flavor, use only pure maple syrup. Serve with cinnamon ice cream hard sauce, or heavy cream. In a large bowl, combine 2 2/3 cups flour and 1 teaspoon salt. Using a pastry blender, cut in the lard until the mixture forms pea-sized chunks. Sprinkle with cold water, 1 tablespoon at a time, and toss lightly with a fork until the dough sticks together in a ball. Divide the dough into two equal parts. Press to form two 5- to 6-inch disks. Dust each disk lightly with flour on both sides. On a dampened countertop, place one disk on a sheet of wax paper; cover with another sheet. Roll the dough to a 1/8-inch thickness. Peel off the top sheet of wax paper. Invert a 10-inch pie plate on the crust and trim to 1 inch larger than the dish. Turn the pastry into the pie plate and remove the other sheet of wax paper. Using a knife, trim the edge even with the pie plate. Moisten the edge of the pastry with water. To make the filling, toss the apples and raisins with the maple syrup, the remaining ¼ cup flour, the remaining ½ teaspoon salt, the cream, cinnamon, and cardamom. Mound the filling in the pie shell. Roll the top crust in the same manner as the bottom. Flip the dough onto the filled pie and trim ½ inch beyond the edge of the pie plate. Fold the top edge under the bottom crust. Press together and flute using your fingers. Brush the crust with the milk. Using a sharp knife, cut vents in the top crust. Bake for 1 ¼ hours, until the crust is golden brown and the filling is bubbling. Cover the pie loosely with foil to prevent overbrowning, if necessary. Do not overbake. Cool on a wire rack for at least 1 hour before serving. 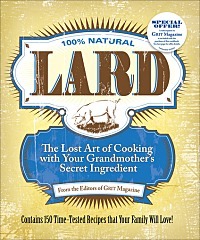 Reprinted with permission from the book LARD, The Lost Art of Cooking with Your Grandmother's Secret Ingredient, by Editors of Grit Magazine. Copyright © 2012 by Ogden Publications Inc. Published by Andrews McMeel Publishing.